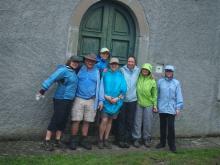 People booking our walking holidays in Italy and Australia often ask us for information about walking kit - here is our advice on what to wear and what to bring with you. In many cases on our tours technical walking gear cannot be easily bought en route so it is important to arrive well prepared. Always remember the famous quote from Sir Ranulph Fiennes: "There is no such thing as bad weather, only inappropriate clothing!" 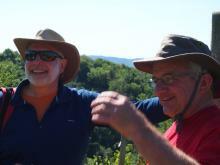 Take a look at our stylish Hedonistic Hiking headbands and hats available for purchase directly from us on tour. The most important thing to get right is your footwear. We highly recommend a strong pair of walking boots with good ankle support. These could be leather or a more modern lightweight waterproof fabric boot. When trying them on in the store make sure you have on the right socks so that the fit is good and there is not too much movement of your foot inside the boot, as this may lead to blisters. 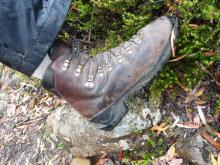 It is essential to "wear in" your boots before embarking on the full week's walking holiday. Some people recommend wearing a thin inner pair of socks under a thicker pair to reduce the chance of blisters forming. 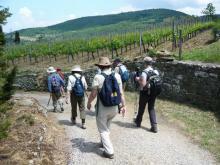 On our more gentle walks, A Tuscan Harvest and The Palio of Siena, an experienced walker might feel comfortable in a walking trainer. However, for all our other hikes we strongly recommend, and always wear ourselves, a boot with good ankle support. They give far greater stability on uneven or slippery trails and much greater protection against wet or muddy conditions. The best advice for clothing is to wear layers. Modern high-tec fabrics for shirts and walking trousers are windproof but also very quick drying, so if you get caught in a shower or rinse them through at night, they will be dry by morning. 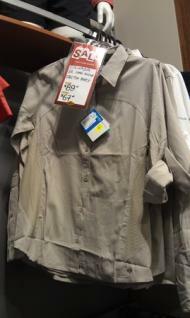 Two walking shirts in this high-tec fabric should be sufficient for a week. On top of the shirt a fleece will keep you warm - especially as temperatures can change swiftly according to altitude and wind chill factors. For hikes in the mountains we recommend you bring a long-sleeved thermal vest/shirt such as those made by the brand Icebreaker. Walking trousers with zip-off bottoms which become shorts are extremely useful. These can vary in price but the more expensive ones tend to be better designed, with zips which allow you to take off the lower section without removing your boots. A good quality waterproof jacket with sleeves eg Gore-Tex is essential - the fabric is breathable as well as being watertight - and a hood will be useful too. 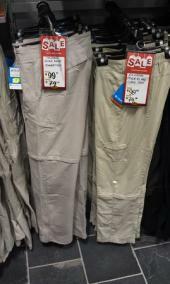 Waterproof over-trousers might also be considered and are necessary if your tour is in a mountainous region as they will keep the wind off as well as the rain. A broad-brimmed hat to shade your face from hot sun is very important and, if you are walking in mountains, you need to bring a fleece or wool hat and gloves. If the temperature drops quickly they will be essential! Sunglasses to protect your eyes from the glare are another essential. Walking with or without poles is a matter of personal preference but two strong lightweight poles can greatly improve your stability and reduce wear and tear on your muscles and joints. The best ones are made of carbon fibre but all poles should have comfortable cork handles with adjustable wrist straps. 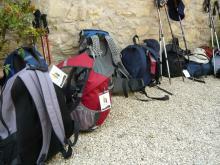 Think about how to pack your poles as they may be too long to fit in your hold luggage. 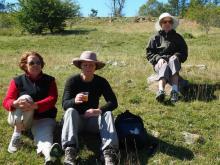 Feedback from Hedonistic Hiking guests has been that poles are essential for the mountain hiking days in Abruzzo, Slovenia, Piedmont, Italian Alps and Italian Lakes, France and Italy and Austria and the Dolomites - as well as on Australian tours. It is worth noting that both Leki and Black Diamond make compact folding poles to fit the smallest of suitcases. We recommend a lightweight hiking back pack, with capacity of approximately 20 litres, to hold your water bottle, extra layers of clothing, a camera and sunscreen and insect repellant. Make sure it has fully supporting waist and chest straps. If you carry more sophisticated camera equipment, a GPS, binoculars etc you will need a slightly larger pack. The most comfortable ones sit away from your back to allow a flow of air between you and the pack. 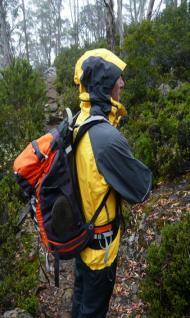 In all cases its a good idea to carry a waterproof cover for your rucksack although these are not 100% watertight. We recommend protecting valuable items by using a Dry Bag, (or plastic bag) inside your rucksack and all good outdoor equipment stores stock these, from brands such as Ortlieb or Sea to Summit. We give all guests on our European tours BPA-free plastic 700 ml water bottles to keep at the end of the tour. 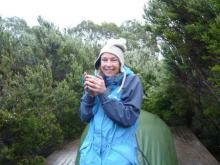 Water can be topped up at lunchtimes and from water fountains or mountain streams along the way. Other people like to use platypus water carriers worn in the back pack with the drinking tube, but guests would need to bring their own. On the European tours we recommend that you carry a minimum of 1 litre per day, and on the Australian tours 1.5 - 2 litres depending on the tour. If you are joining a tour in Australia you will need to bring your own water bottle. As we accompany you every step of the way on the walks, we will always have a fully stocked first aid kit, extra water supplies and walking snacks to keep you going between meals! In December 2018 we renewed our Leaders' Wilderness First Aid qualifications. Don't forget if you take any prescription medication to have sufficient to cover your holiday period, and have the names of the medicines written down should they need to be replaced. Do remember to let us know if you have any special dietary requirements or food allergies. Breakfast in Italy is a largely sweet affair with most hotels serving a selection of cakes, brioches and pastries, and usually some basic cereals. We make every effort to ask our hotels to provide fresh fruit, yoghurt, meats and cheeses etc but if you have a particular breakfast bran or muesli, herbal tea or savoury spread for example which might not be easy to find overseas then you might like to think about bringing a small supply with you. Contact your mobile phone provider to see what your options are when you are overseas. Most will offer a travel pack and you can decide what is best for you. Here is an example from Telstra and this is the link for more information: https://www.telstra.com.au/international-roaming. Vodafone also operate in Italy. You can also check with your provider the cost of sending receiving texts/phonecalls overseas if you don't buy an international travel pack. A second option is to buy a Italian SIM card from a phone shop once you arrive in Italy and load it with 20 euros. Then you will have an Italian number which your family or friends can call you on, and there will be no charge to receive calls. All the hotels we use have WiFi so if you have a smartphone or tablet you'll be able to email and if you use Skype, WhatsApp or Facebook you can chat for free. Our dinners in the evening are usually relaxed and informal - they range from local trattorias to more elegant restaurants but very smart evening wear and jackets with ties will not be required. It is always lovely to read about an area when you are travelling through it on foot, as this can truly bring the region to life. We have prepared a reading list for Italy and Australia which you might like to peruse. Many people on walking holidays like to record with paints or notebooks what they have seen and learnt during the day, so packing paper and pen or watercolours is another idea. We will provide you with luggage labels on arrival. Let us know if you would prefer us to post them to you beforehand. We have two 9-seater minibuses to transport guests and their luggage (one minibus for smaller groups). Luggage space is limited and we ask you to limit your luggage to one medium-sized bag/suitcase (max 70cm x 50cm x 25cm) and one piece of hand luggage (generally your walking rucksack). If you are on an extended holiday and have extra luggage we cannot guarantee we will be able to transport it for you on the tour and it may be necessary to store this at left luggage at the airport or in your pre or post-tour hotel. If you have concerns about this there are companies in Europe, such as Send My Bag, who will move luggage for you from city to city, meaning anything you don't need on the tour can be waiting for you at the end of the hike. 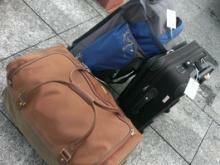 Below is a picture of suitcases which are ideal for our trips. 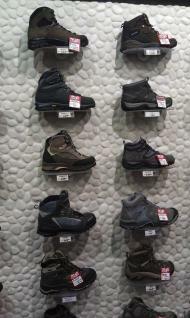 As above, outdoor equipment stores have a wide range of walking clothing including lightweight, quick-drying trousers and shirts which are excellent. There is little, if any, opportunity to buy equipment en route. We don't recommend you travel with expensive jewellery (or other high value items) - it will not be required in the evenings and you won't have to worry about securing it in hotel safes during the day. 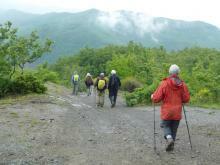 It is a condition of walking with Hedonistic Hiking that you have adequate travel insurance for your belongings. You will not need to worry about having a different outfit for every evening - we certainly don't! As explained above, if you are travelling with more than one medium-sized suitcase and your day-pack, we cannot absolutely guarantee that we will be able to transport excess luggage whilst on the tour, as the space in the vans is limited. If you have concerns about this there are companies in Europe, such as Send My Bag, who will move luggage for you from city to city, meaning anything you don't need on the tour can be waiting for you at the end of the hike. For added security leave a photocopy of your passport at home.